The market saw a nice recovery during last week. Many are still predicting and forecasting that this market will crash again. They are all idiots. Do not put your money on their bets. Study the market’s history and you will see that in the last 16 occurrences of 10% corrections since 1950 the market dipped back down only in one case. In 15 remaining cases the market reversed and never retested the lows of previous correction. Of course, anything can happen and that because in the last 15 occurrences the market never retested the lows is not a guarantee that it will do the same this time. but odds are high that this seasonality will repeat and this market will continue higher as it did in the past. As I said before the selloff however, provided a great opportunity to buy new shares of cheap stocks and run this rally up. This week we didn’t buy any new shares (but we will be buying next week). In the last week we recovered majority of the paper losses from the previous correction and as the rolled trades keep becoming worthless our accounts are marching up in value again. We also made nice additional income this week of $1,600 dollars in our IRA account. 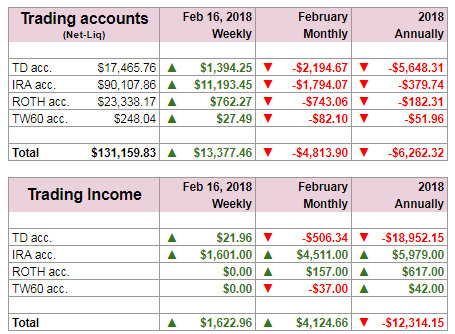 The trading account and other retirement accounts didn’t produce much income this week since we have small money in those accounts and we are currently fully invested. With small accounts, trading is a bit slower than with large accounts. But I have patience.